Windies off-spinner Ashley Nurse has been ruled out of the remainder of the India tour with a pectoral muscle injury. 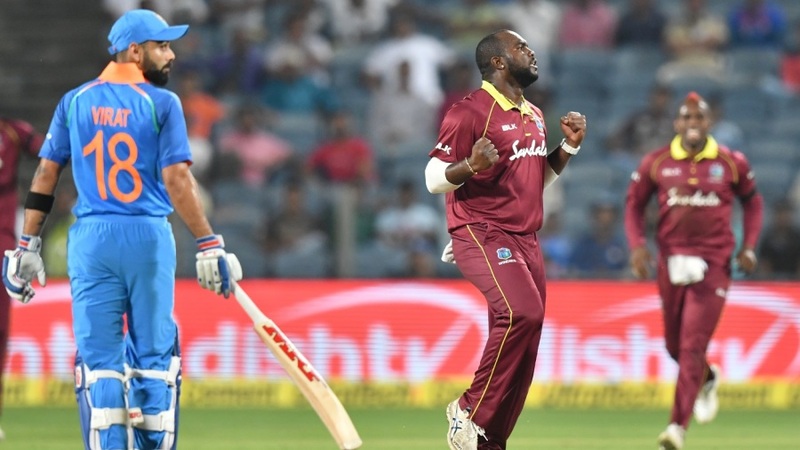 Windies skipper Jason Holder confirmed the news during the toss before the fifth ODI against India on Thursday. Nurse was looking far from his best in the fourth ODI which Windies lost by 224 runs. He was clearly uncomfortable while bowling due to the problem in his shoulder. The spinner had also gone off the field after bowling a couple of overs, compelling Jason Holder to resort to the part-time services from Rovman Powell. He later returned to the game but failed to make any impression. He ended up conceding 57 off 8 overs and picked up one wicket. With the bat, he scored 8 runs. His participation in the fifth ODI was very much in doubt as he had arrived in Thiruvananthapuram with his hand supported by a sling. And just ahead of the crucial fifth game, Holder confirmed the news. “He (Nurse) is ruled out for the entire tour. I wish him well. Hopefully, he can recover quickly for the next tour,” Holder said. Missing Nurse will be a huge blow for the Windies considering the spinner’s performance in the first three games. He had played a key role with both bat and ball in his side’s 43-run over India in the third ODI. Windies were reeling at 227 for 8 and even reaching 250 was looking like a distant dream. However, Nurse blasted 40 off just 22 to take his side’s total to 283 for 9. He had then gone on to take two crucial wickets including that of the opener Shikhar Dhawan as Windies bowled India for just 240. Nurse’s all round performance had helped him win the Man of the Match award. The T20I series, meanwhile, will get underway from November 4. After the series in India, Windies will fly out to Bangladesh.